I visited the museum any number of times during my childhood. We lived in Surrey, about half an hour’s train ride from Waterloo, and many Sundays were spent going up to town for a wander around. My favourite places for walking were the South Bank (still is) and South Kensington, home to all the main museums. Whether I was most fascinated by the Natural History Museum or the Science Museum around the corner is a tough call. Often we’d go to both. The Natural History Museum though definitely takes the prize for best building of the two. It’s one of the most exquisite buildings in existence, like a cathedral, except it celebrates real things, life and nature and evolution, instead of something imaginary as cathedrals normally do. I can’t seem to find any decent images of the building on the web that aren’t copyright-protected, so click here to Google some up or here to see lots on Flickr. There’s also a fascinating section on the NHM website about the history of the building and its architecture. This badge though might also have been collected during a school trip. I remember one visit when I was about 10, and a guy outside selling rosette badges from a tray around his neck with photos of different pop stars. I bought an Adam and the Ants rosette and a friend bought a Madness one. Sadly said rosette isn’t included in the badge collection, but they were probably knock-offs anyway. The only other thing I remember about that visit to the museum is using a computer for a quiz. There was a small screen built into a display unit and three or four buttons for answering multiple-choice questions. Some of the possible answers were obviously wrong, and my friends and I found that if you deliberately pressed the wrong answer enough times the computer got annoyed and realised you were doing it on purpose. It gave a warning of something like “If you press that button again, the quiz will restart and your score will be deleted.” So of course we pressed it to see if it would make good on its threat. It did. 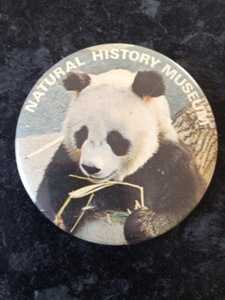 UPDATE 20/6/13: My excellent friend and panda expert Jules has since pointed out that the image is most likely of Chi Chi, a much-loved giant panda and resident of London Zoo from 1958 whose remains were exhibited in the Natural History Museum after her death in 1972. I don’t particularly remember seeing Chi Chi at the museum, although I’m wondering now if the badge was obtained on a forgotten, much earlier visit occasioned by said exhibitionary taxidermy.